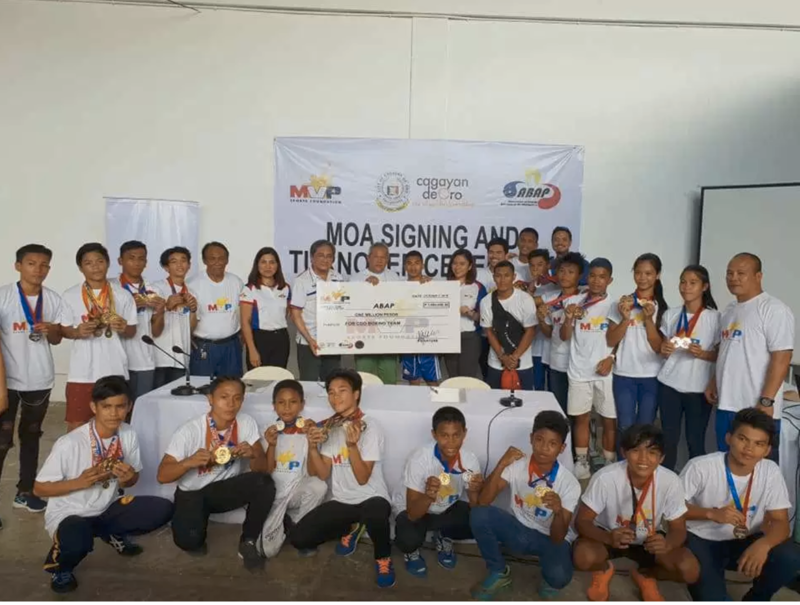 The Cagayan de Oro Boxing Team has just received an early Christmas gift courtesy of MVP Sports Foundation (MVPSF) which donated P500,000 worth of boxing equipment and another P500,000 in financial assistance. In a simple turnover ceremony held yesterday, October 7 at the Cagayan de Oro Boxing Training Center in Aluba, Macasandig, City Mayor Oscar S. Moreno together with ABAP Region X Director Atty. Jang Moreno received the check from MVPSF executives led by Patricia Hizon, Maita David, Art Aro and Lean Aure. The city’s amateur boxing team has been producing the country’s young boxing talents in recent years. Accordingly, there are at least 60 young boxers in the fold who will benefit from the donation. Asian Games Bronze medalist Carlo Paalam (left) who was once a product of the city’s boxing program attended the event.